These are the nominees for the best cinematography. These videos are recent to me, being that I just discovered them. If it was up to me, I would put up all Micheal Jackson videos, but no, these are the most recent and international. Now you be the judges and chose a winner. Morning Musume, sometimes referred to as Momusu, is a Japanese girl group formed in 1997 by rock singer-songwriter turned record producer Tsunku, who later composed a vast majority of the group's songs over the decade. Iggy Azalea, which is not her real name, is an Australian Born rapper, who made her American debut with the song work. The video is explicit, so I uploaded the UK version instead. These are some of my fravoite chinese, vietnamese and taiwan music artist. I list no order of nationlaity, just name and songs. When I saw this all I could do was watch, too curious to try to understand what was going on. I still don't understand but who cares, this is too funny. These are the kind of videos I hope to find on YouTube. Nancy Nabil Ajrame is an Arabic pop singer from Lebanon. Nancy is a multi-platinum recording artist and Goodwill Ambassador for UNICEF. With the support of her father, Nancy began performing as a child and released her first studio album by the age of 15. Nancy Ajram song Fi Hagat is the first Lebanese song I had ever listened to, and the best song. I continued to listen to all her music and quickly fell in love with Lebanese music. The Videos I posted are mostly Nancy's song along with Massari and other great Lebanese singers. These videos had concept, entertainment, high-quality cinematography, and a essence of cultural flavor. Enjoy! If you don't know what the Holocust is, i am not going to explain it becuase it's a bit tiresome and I am starting to get sleepy. But once you watch these films you will know everything. Anne Frank is one of the most popular biography of a young girl dairy on what happened to her during the Nazi terror on the Jewish people. 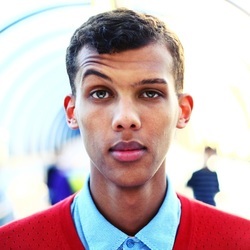 Paul Van Haver, Better known as Stromae was born on the 12 of March, 1985. Stromae is a Belgian singer, composer and song writer. He has distinguished himself in both hip-hop and electronic music. His fame quickly rise when he debuted with his single "Alors on Danse" which remained a number 1 hit for several weeks in numerous countries throughout Europe.